Balmain Paris Hair Couture's 'Fall/Winter '16' cosmetics bag is the perfect set for newcomers to the brand. Suitable for all hair types, it's filled with a travel-friendly sized shampoo and conditioner enriched with nourishing Organic Argan Oil. 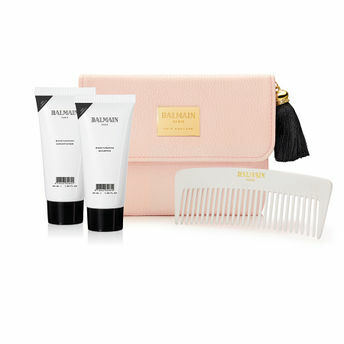 Keep your tresses tamed with the lightweight curved comb - it's housed in the baby-pink textured-leather case. A perfect gift to treat yourself or someone else.